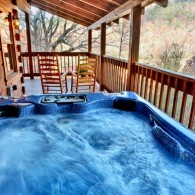 Miles Away on Monday: Viva La Hot Tub! 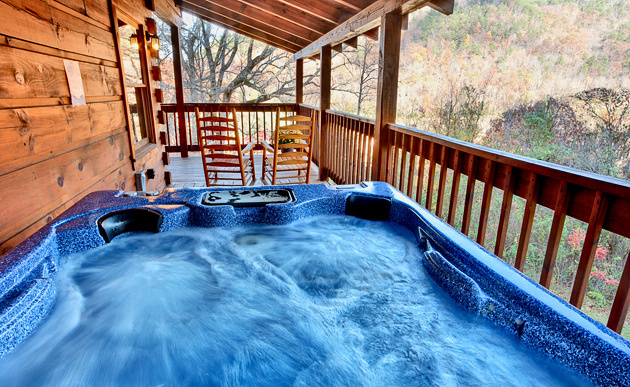 We might be right on the edge of December, but it’s not too late for a dip in the old hot tub! The air has a chilly nippy feel, but the water in the tub is steaming up my camera lens! 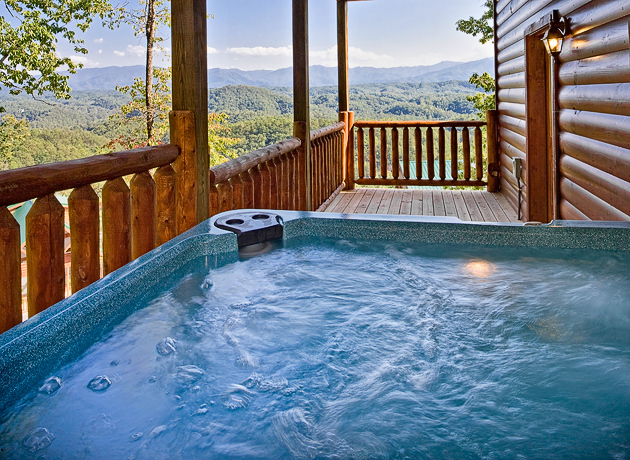 No need to daydream … come on down to the Smokies. 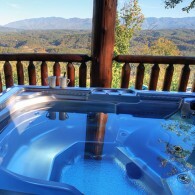 Gatlinburg has the million holiday lights turned on, and almost a million hot tubs. It’s a great time of year for a visit. If you do come, please stop in and visit me to see the complete display of Smoky Mountain Photography at the William Britten Gallery in Gatlinburg, TN. It’s a blue-sky morning, clouds floating by. The Smoky Mountains are shimmering in the distance. Two cheerful rockers wait for you on the deck. Take a few moments, sit down, take it all in. 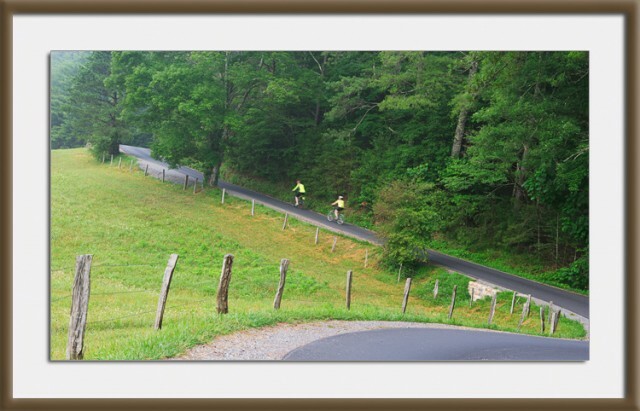 I can’t think of a more idyllic way to get your exercise than to bike the Cades Cove Loop in the Great Smoky Mountains National Park. From May through September on Wednesday and Saturday mornings until 10:00 the Loop Road is closed to motorized vehicles, so the entire glorious 11-mile scenic road is open for biking and hiking. Wow! This is one of the greatest experiences anywhere. If you can’t schedule your ride for Wednesday or Saturday, bicycles and walking are allowed any day, but you should start early to avoid the traffic that builds up later in the day. 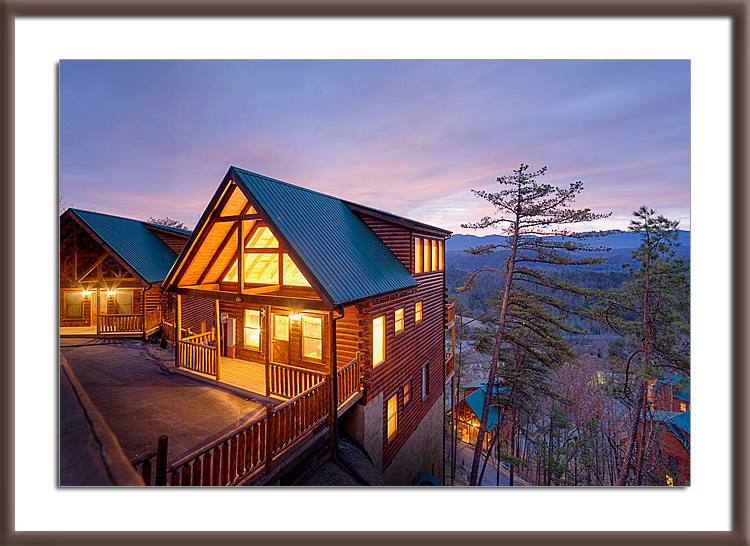 Bare trees, the welcoming glow of Smoky Mountain cabins at dawn … a warm and friendly Kinkade-colored scene. It’s that time of year when, surprisingly, winter has already started to lose its grip in the Smoky Mountains and Gatlinburg area. In a few short weeks the early flowers will be staking their tentative claim on the new season. But for now, it’s still chilly and bare, with more snow always a possibility. A great time to enjoy some solitude in the mountains. If you can get away, you’ll find the streets of Gatlinburg are less crowded, and there will be very little traffic in the National Park. 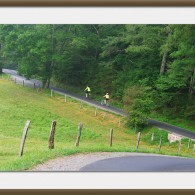 You can drive the Cades Cove Loop unimpeded by gridlock! 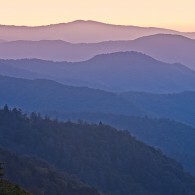 And I’ll look forward to visiting with you in the William Britten Gallery where you may view the entire collection of Smoky Mountains photos. Not too many days like this are left for us this year. Mid-autumn Indian Summer. The hectic days of October are done for another year. 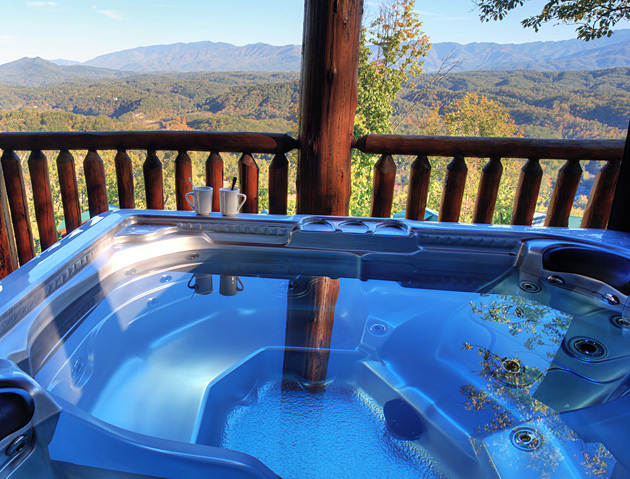 A hot tub and a couple cups of coffee beckon you to relax the morning away. 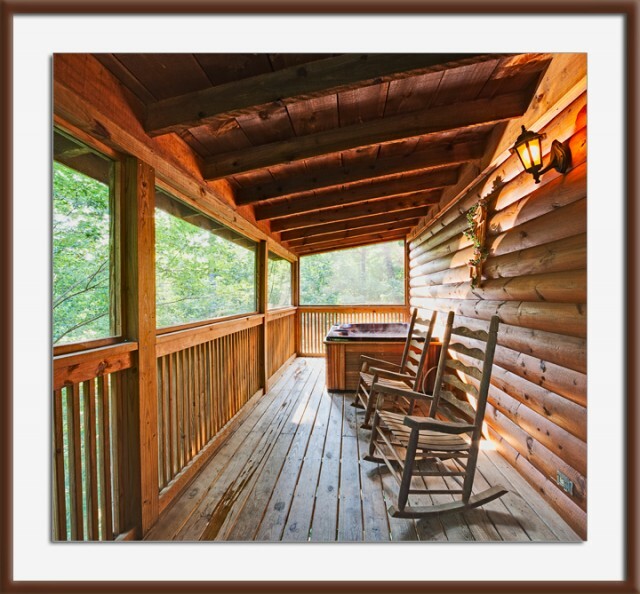 When you’re all softened up, please come on over and visit me to see the complete display of Smoky Mountain Photography at the William Britten Gallery in Gatlinburg, TN. 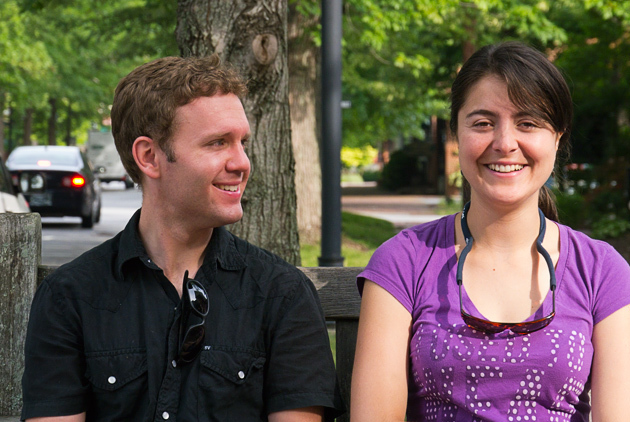 Today we take a break from Smoky Mountains news and photos to share something personal. Leaving our cats and dog to a house-sitter, Sarah and I are driving down to Atlanta to catch a flight to South America! We’re headed to Bogotá, the capital and largest city in Colombia. Way up in the mountains at close to 9,000 feet, we will be even higher than Clingmans Dome! The reason for our trip is the wedding of my son, Justin, and his dear Lili. If you’ve been following this blog for a while, you will recall Justin and Lili visited last summer … and Lili saw her first bears ever … 9 of them! We’re looking forward to the wedding and to meeting Lili’s family, and celebrating Justin and Lili’s happiness. 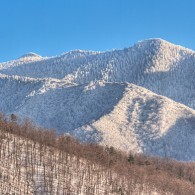 Smoky Mountains in late-winter. Still the weak, watery light. Crisp, thin air. 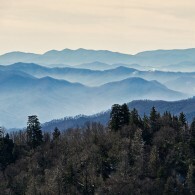 The Smokies look like they’re shaking off a long sleep, just waking up. But if you walk into the woods, there are definite signs of awakening life. Yesterday I drove out into the Greenbrier area and turned up the road towards the Ramsay Cascades trailhead. Just past the last bridge before the trailhead parking area, I pulled over. There’s a large flat area there that was once someone’s field. Walking back a ways further I came across an old rock wall … more indications of the old homestead. 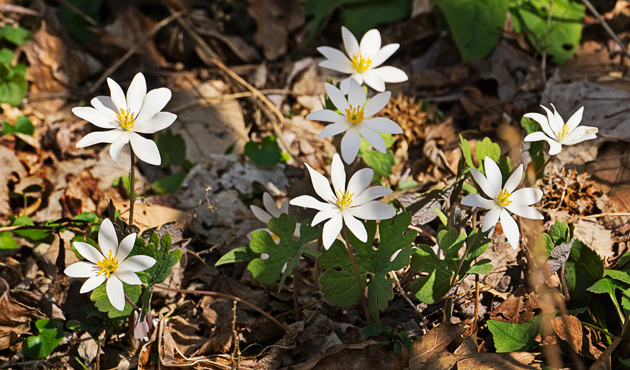 Hundreds of Bloodroot and other wildflowers were popping up all over the forest floor. This is one of my favorite times of year. The woods are still wide open and free of overgrown weeds, so it’s fun to just pull off the road and take a walk anywhere without being on a trail. And the sense of new life and the beauty and wonder of springtime is very powerful. The cycle begins anew. 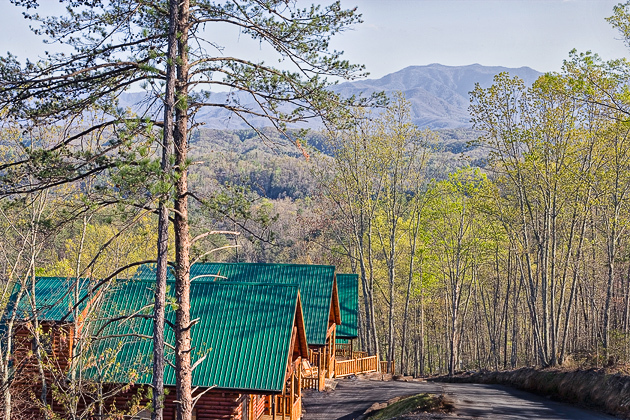 The other welcome awakening this time of year is the return of vacationers to the Smokies! If you are one of them, please consider a visit to the Arts and Crafts Community along Glades Rd. in Gatlinburg. 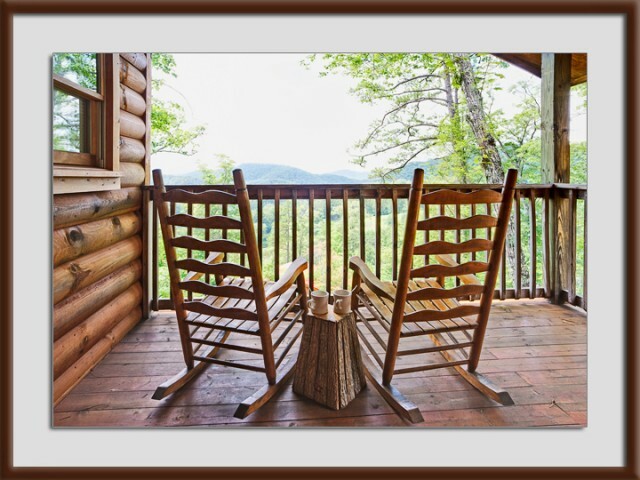 You’ll find my complete display of Smoky Mountains scenes at the William Britten Gallery, and there may be a special photo to remember your time here. Miles Away on Monday: Winter Hot Tub! 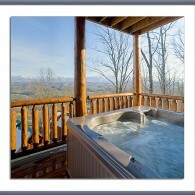 This scene is classic winter-get-away-from-it-all Gatlinburg-style. 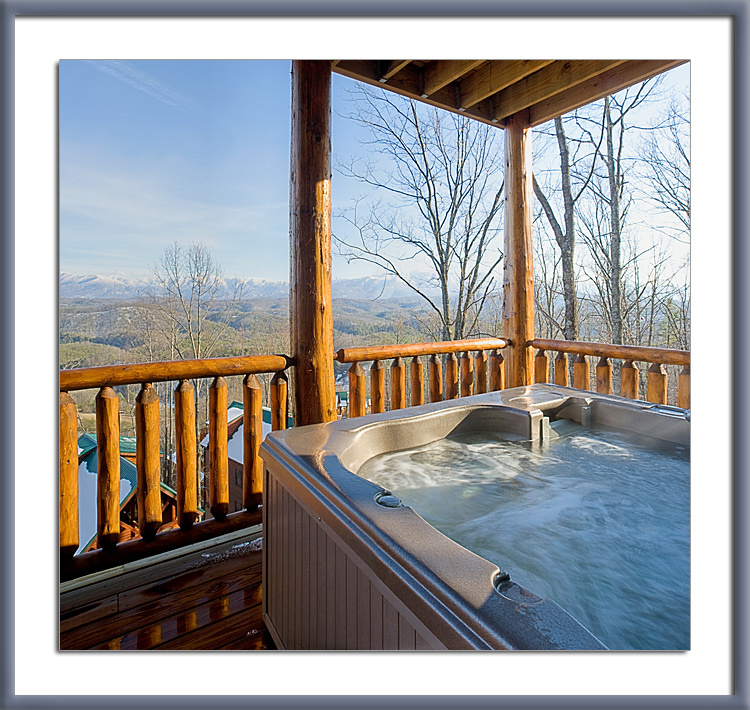 The snow-capped Smoky Mountains in the distance, snow laying on the rooftops of surrounding log cabins, and the hot-tub fired up and steaming. Ready for some serious cold weather relaxation and daydreaming! 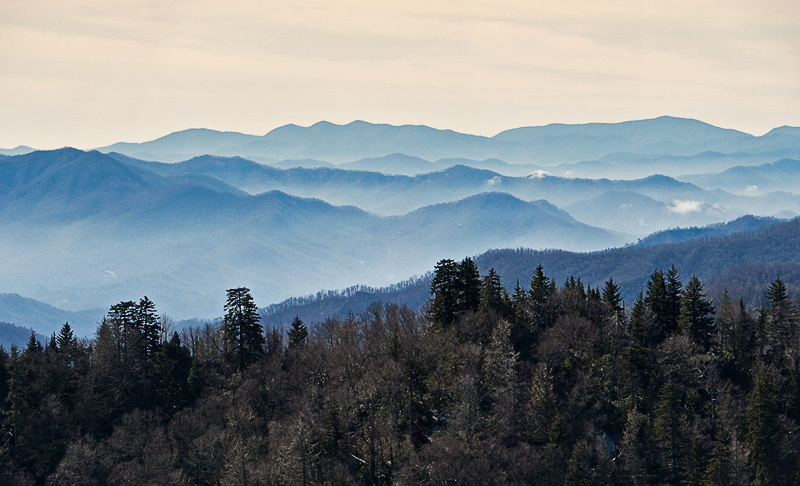 The offseason is one of the best times to visit Gatlinburg and the Smokies. Downtown is still festive with the light display, restaurants are warm and welcoming, and the Great Smoky Mountains National Park offers the alternative beauty of its restful season. The atmosphere is that of a mountain village in the deep of winter. If you can make it to our area, please stop in and visit me to see the complete display of Smoky Mountains Photos at the William Britten Gallery along the historic Arts and Crafts Trail on Glades Rd in Gatlinburg, TN. 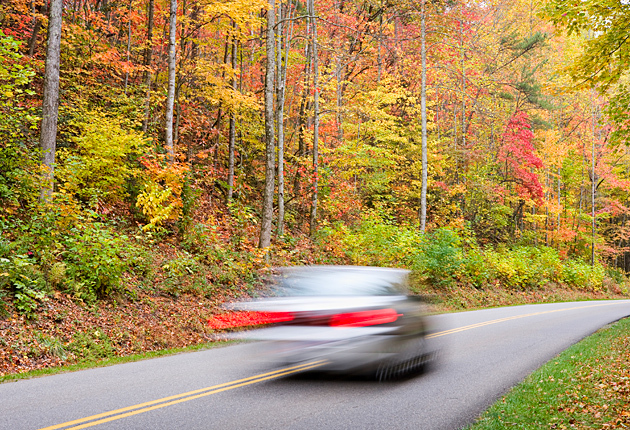 Everyone loves to get out and drive in the Smoky Mountains during the autumn leaf season in October. It’s all about sensory overload. 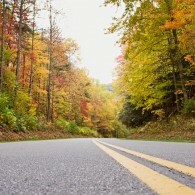 The colors flying by, the smells of dry leaves, the sensation of getting down the road and getting away from it all. A stunning time to take a few photographs. Unfortunately, we’re all out there looking for this sensation at the same time, and the traffic creates a slow-motion crawl, rather than a zip to freedom. I get out very early. The picture above, where I set my camera on the pavement, would have gotten me flattened later in the day! 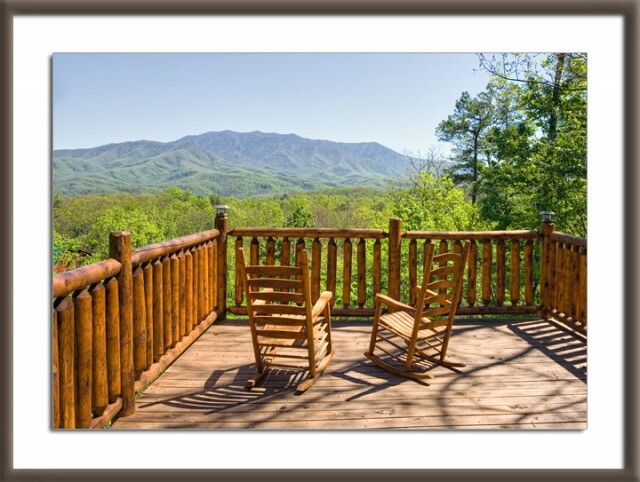 After your drive, please stop in and visit me to see the complete display of Smoky Mountain Photographs at the William Britten Gallery along the historic Arts and Crafts Trail on Glades Road in Gatlinburg, TN. And for one more week, until October 23rd, I will also have a display at the Craftsmen’s Fair at the Convention Center in downtown Gatlinburg. Wow. What can you say? These are the days that take your breath away. Blue skies and golden light day after day. Save it up for winter. This cabin is high on a ridge about 10 miles out from Mt. LeConte and the Smoky Mountains in the distance. The two chairs are just waiting for a couple of folks to sit down and relax amid the splendor. Maybe they’ve been inspired to take a hike or grab their camera and take some photographs. They’ll be back soon. The chairs will wait. 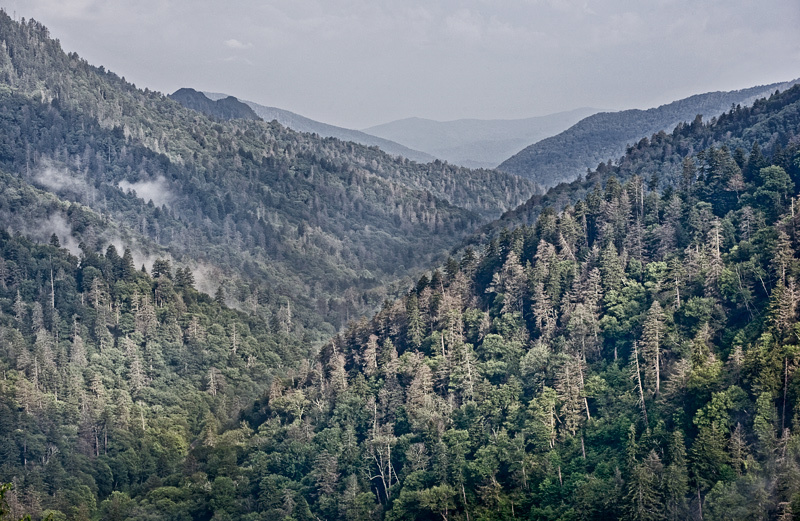 Come on oever to the Glades and visit me to see the complete display of Smoky Mountains Photography at the William Britten Gallery in Gatlinburg, TN. Until October 23rd I’m also down at the Gatlinburg Convention Center for the annual Craftsmen’s Fair. It’s October already, and the carefree days of summer have slipped away once more. 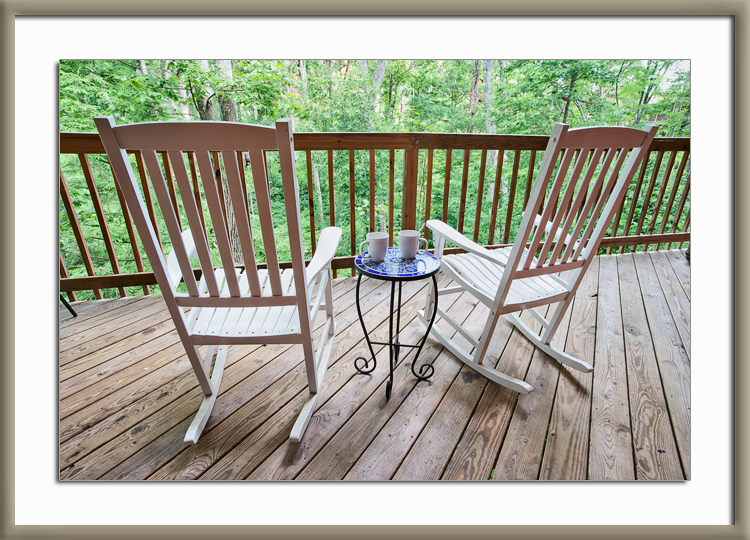 This may be our last chance for a while to sit out on the deck and enjoy a quiet coffee moment. 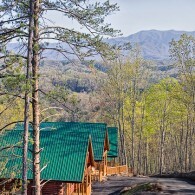 Here in Gatlinburg, on the edge of the Smoky Mountains, October is the busiest month of all. 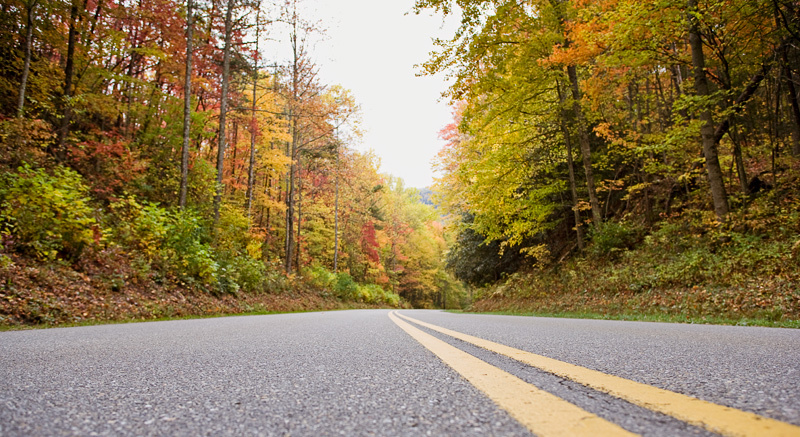 The leaves begin to turn color, and visitors head to the Smokies to enjoy the autumn roads and trails. Life speeds up as we work seven days a week in our Gallery on Glades Road and downtown at the Craftsmen’s Fair. But it’s a happy time, something like getting the harvest in before winter. The Craftsmen’s Fair will begin this Thursday and run through Sunday October 23rd. The fair is at the Gatlinburg Convention Center, at stoplight number 8 on the Parkway. You can find my booth at the bottom of the escalator as you enter the main exhibit hall. 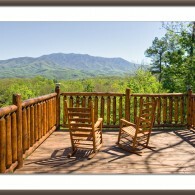 You can see my complete display of Smoky Mountains photography at both locations. Summer is almost over, and the hot humid days are transitioning to crisp and cool. Green leaves are fading to oranges and yellows. Plans for the day are still shaping up. There’s a moment here to relax with a coffee break or a cup of tea. Enjoy the stillness of the woods or identify a songbird. Clear your mind of past and future, stress and worry. Concentrate on the tastes and smells, and the sensation of quiet pause. Practice being right here, right now. 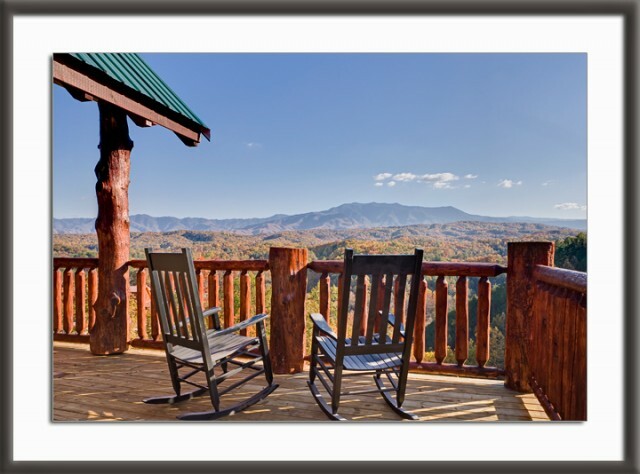 If time allows, please stop in and visit me to see the complete display of Smoky Mountains Photography at the William Britten Gallery in Gatlinburg, TN. I’m in the Morning Mist shops along Glades Road. 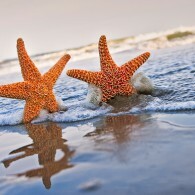 Miles Away on Monday: Beach Trip! It’s not always about the Smoky Mountains, and sometimes I get miles away also. 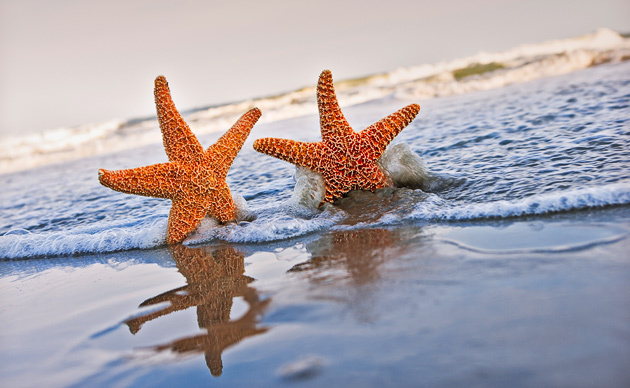 This week we’re away on a beach trip to South Carolina. While we’re away, you can still stop in to see the complete display of Smoky Mountains Photography at the William Britten Gallery on Glades Rd. The Gallery will be open several days this week, with Mary waiting to greet you! 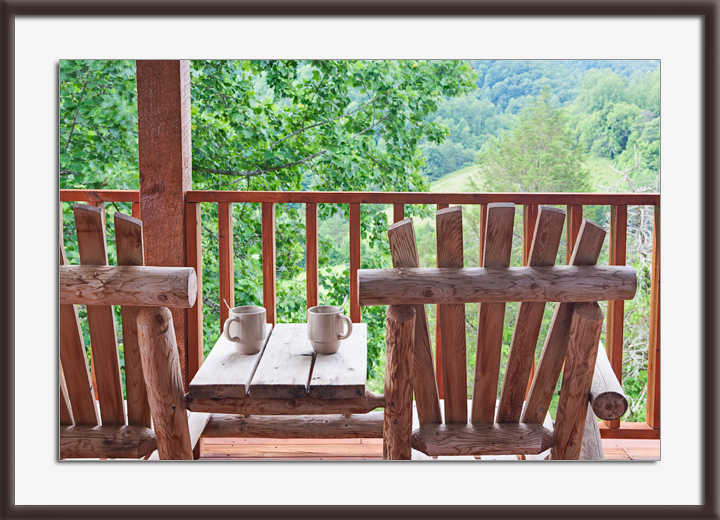 Pull up a chair, fill your mug with coffee or tea. The morning sunlight is soft and inviting. The mountain view invites daydreaming. Days like this are meant to unfold at their own pace. When you plan your next Smoky Mountains getaway, please consider a visit to see the complete display of Smoky Mountains Photography at the William Britten Gallery in Gatlinburg, TN. You’ll find me along Glades Rd, along the Arts and Crafts Trail. 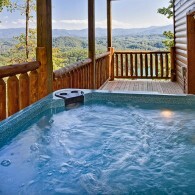 Is it too decadent to grab your coffee and jump into a Smoky Mountains hot tub first thing in the morning? Of course not! The summer air has a hint of snap too it early in the morning, and the warm water feels so good. And that view! As always, the door is open and the welcome mat is out at the William Britten Gallery along the historic Arts and Crafts Trail on Glades Rd. in Gatlinburg, TN. You’ll find the complete display of my Smoky Mountains photography to tempt you with a special Smokies memory to take home with you. 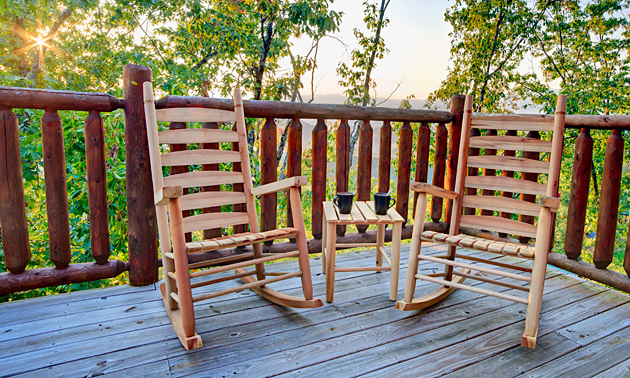 The day is drawing to a close, time to grab a chair on the porch and relax, watch the evening sky descend over the Smoky Mountains. Listen to the crickets, maybe a whippoorwill, or an owl if it’s getting late. A good time for quiet conversation, reflection on what’s important in your life. 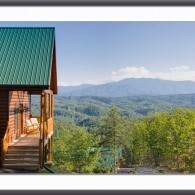 If time allows, please stop in and visit me to see the complete display of Smoky Mountains Photography at the William Britten Gallery in Gatlinburg, TN. I’m out on Glades Road along the Arts and Crafts Trail. Hello! 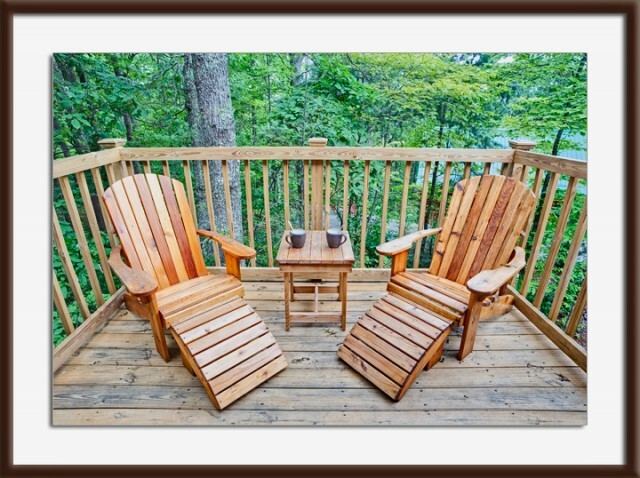 Come on out on the deck and enjoy the privacy. 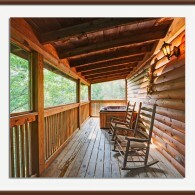 The rocking chairs are waiting. Steam is rising from the hot tub into the cool morning air. The view into the woods is quiet and serene. Bring a book out and sit for a while! These are times to contemplate what is good in life, what is right in the world. If you’re lucky enough to be sitting here enjoying the morning with your family or friends, you’re lucky enough! 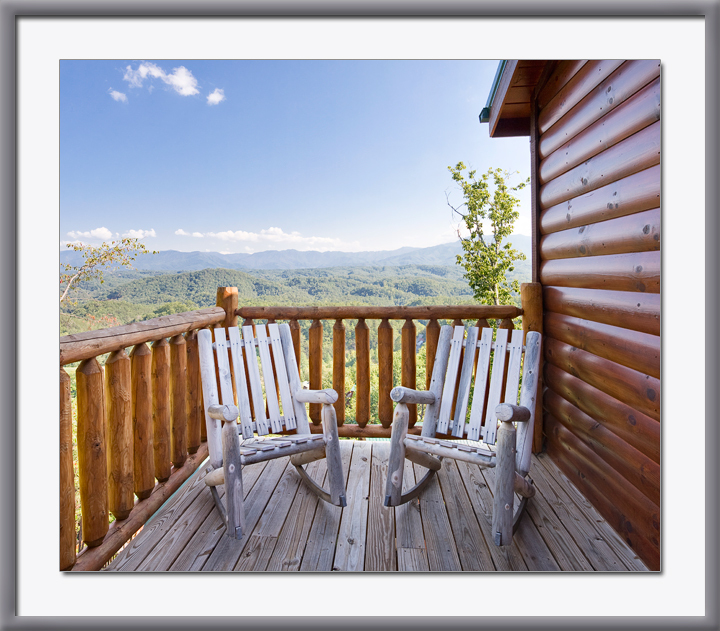 Later on you might come over and visit me to see the complete display of Smoky Mountains Photography at the William Britten Gallery in Gatlinburg, TN. 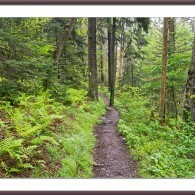 Ah … those feathery ferns guide the way down this hiking trail that clearly is headed towards serenity. There’s a little clump of bluets to enjoy … see them on the left side of the trail in the foreground? Everything is sparkling new-morning bright, still dew-covered or maybe it’s the mist in the air. Oh, and that air … Spruce and Balsam scents mixed with the earthy smell of the ferns … wow, just to stand here a minute and breathe. Clean and fresh and natural … the antidote for modern life! Last week I extolled the pleasures of high-elevation hiking in the Smoky Mountains, and today’s thoughts still find me enjoying these often fog-shrouded walks. 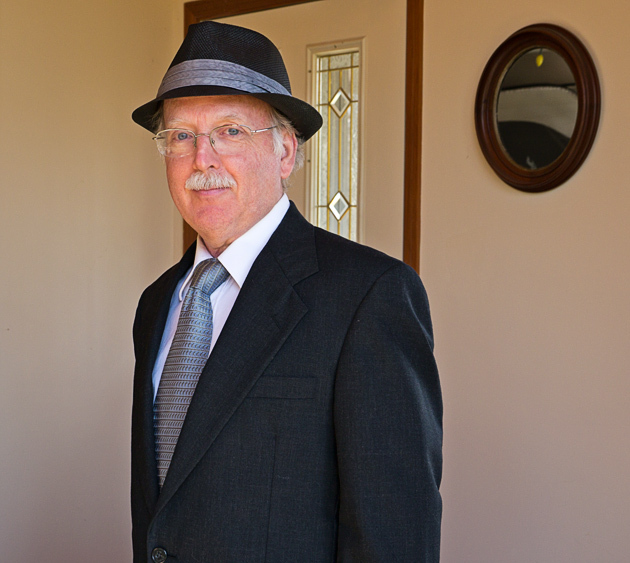 You can click on the image above to see a larger version. 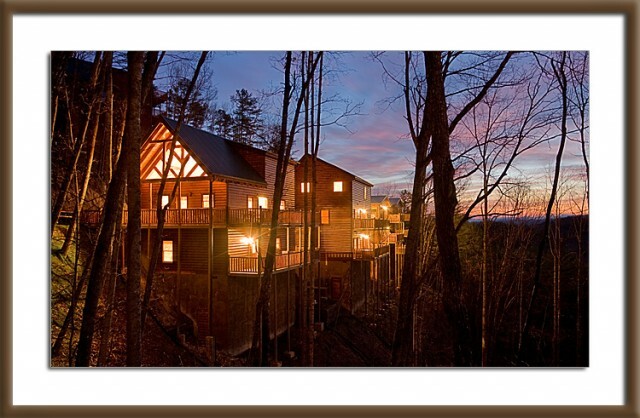 The William Britten Gallery on Glades Rd in Gatlinburg is where you’ll find all of my attempts to capture the feeling of being miles away in the Smoky Mountains. Never too busy to sit down for a moment or two. Or three. The summer season is just beginning. The nights here in Gatlinburg still have a snap to them, the cool air comes rolling down the Smoky Mountains. Mist in the mornings, windows and doors opened wide to capture some freshness for the day. These quiet moments are precious. Here are a couple of hiking recommendations for the day. Both trails will take you on a short hike to a destination with some Smoky Mountains history. First, starting from Elkmont, take the Jakes Creek Trail up to artist Mayna Avent’s Cabin. Or a similar one-mile walk from the Metcalf Bottoms area will take you to the Walker Sisters homestead. Either of these hikes will be a wonderful and relaxing way to spend a half-day. 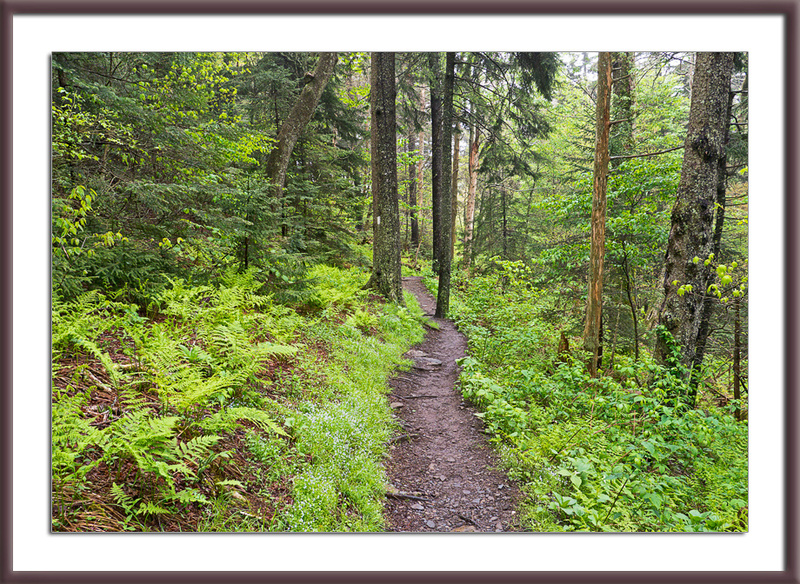 When your hike is done, please consider a visit to see the complete display of Smoky Mountain Photography at the William Britten Gallery in Gatlinburg, TN. I’m on Glades Rd along the historic Arts and Crafts Trail. Ah, Smoky Mountains Dreamin’ … you wake up and feel like you’re in a Thomas Kinkade painting. Soft morning light, the cabins around you still shaking off the night, a little fantasy village. 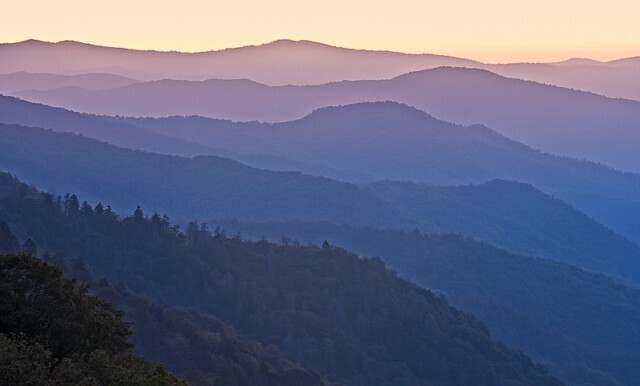 The Smoky Mountains off on the horizon, greeting the day in their own proud way, beckoning you. This is one of the attractions that draws people to the Smokies over and over. To enter this world, miles away, something that touches a place deep inside their heart. Almost something that can’t be said, can only be felt. Really, this is what I try for in a photograph … something that can be felt but not spoken. William Britten Gallery in the Morning Mist Village on Glades Rd in Gatlinburg. 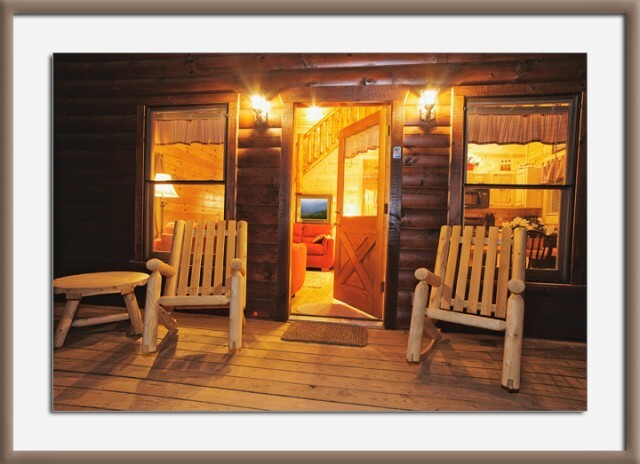 I also do resort cabin photography for a select number of rental agencies and owners. It’s a moody Smoky Mtn Monday in early May. The valley is lush with spring green, while the upper elevations are still shrugging off winter. The vantage point for this view is the Oconaluftee Valley Overlook, gazing into North Carolina from the parking area off Newfound Gap Rd. This is a spot for the usual quick zoom-in-take-the-photo-zoom-out. But here’s an idea: throw a couple of lawn chairs in the trunk, come early with a take-out breakfast and coffee, and settle in to watch the morning arrive. You won’t be sorry you gave the time to it. Some days from this spot you will see rivers of fog flowing like pillows along the valley. Other days might feature a dramatic colored sky and sunrise, as was the case the day I took a best-selling photo, Listening to Silence. But no matter what the mood of the day, it is a place to listen to the dramatic silence of a Smoky Mtn dawn. 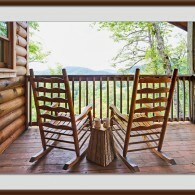 The William Britten Gallery features all of my Smoky Mountain photos. They are meant to be contemplative and serene, and bring the spirit of the mountains back home with you. Could life get any better than this? 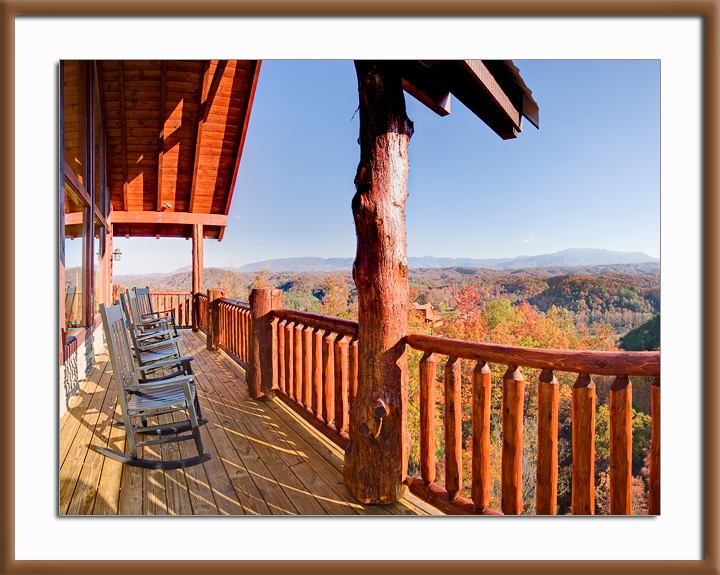 So many cabins, so many great Smoky Mtn views, plenty of time to enjoy it all. Mt. LeConte beckons in the photo above. This resort cabin sits high on Shields Mountain, about 10 miles out from the Smokies. 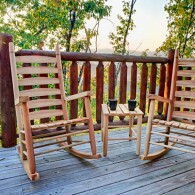 With some rocking chairs on the front porch and a hot tub on the back deck, you can sit and let time drift on by. Please stop in and visit me to see the complete display of Smoky Mtn Photography at the William Britten Gallery in Gatlinburg, TN and take home a photo memory. 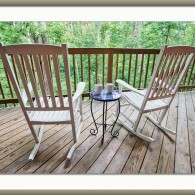 A rocking chair, a cup of coffee or tea, the sun coming up over the Smoky Mountains. The air is soft and cool, and the day is new. 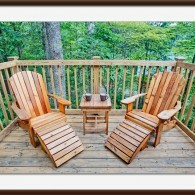 Settle into a chair and enjoy the relaxing moments. You’re miles away from cares and stress. Your daydreams are all that matter. 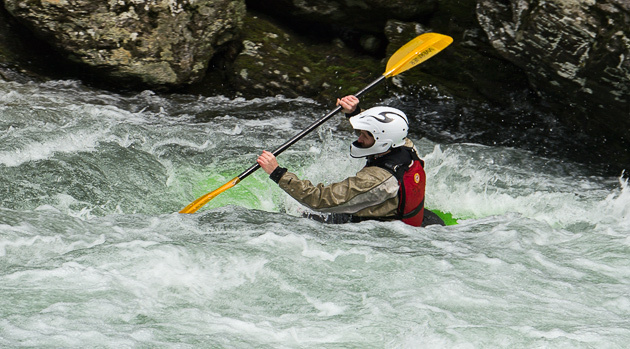 Heavy rains make the creeks rise and creates great conditions for kayaks. I ran into a group of students and staff from Purdue University last week. 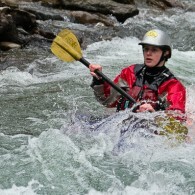 They were miles away from home on a Smoky Mountains spring break kayaking trip. 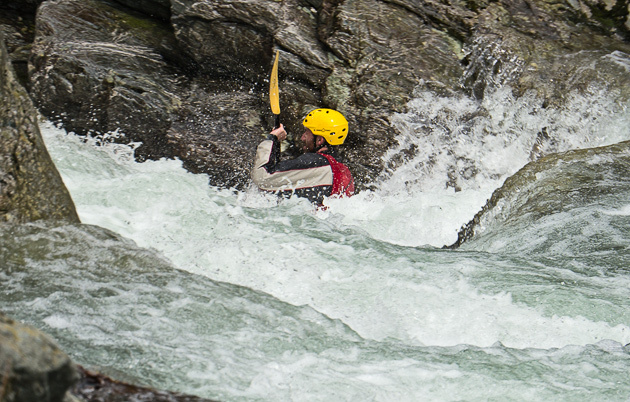 You can see from these photos that there was a lot of whitewater along the Little River Gorge that day. The rides looked very exciting to me! We’ve enjoyed the kayakers before. There were those wildmen who conquered the Sinks. 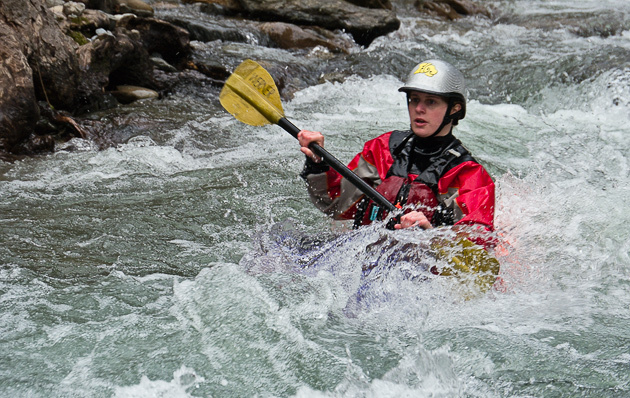 And last spring I took photos of kayakers in the Greenbrier and along Newfound Gap Rd. 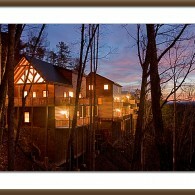 Please stop in for a visit at the William Britten Gallery in Gatlinburg. 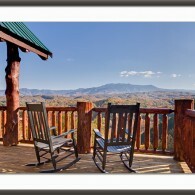 The complete collection of my Smoky Mountains photos are on display. 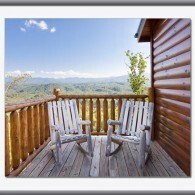 Last week we experienced a popular Smoky Mountains view at the Oconaluftee Overlook. This time we’re enjoying the view from Morton’s Overlook. 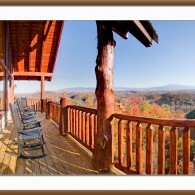 The photograph above is looking west, down the valley towards Gatlinburg. You can see the twin bumps of the Chimney Tops in the upper left portion of the photo. This view spot is a short drive from Gatlinburg. Drive into the Smokies and head up towards Newfound Gap. Before you reach the summit, there are several pulloffs to the right. Morton’s is the only one with an identifying name sign. 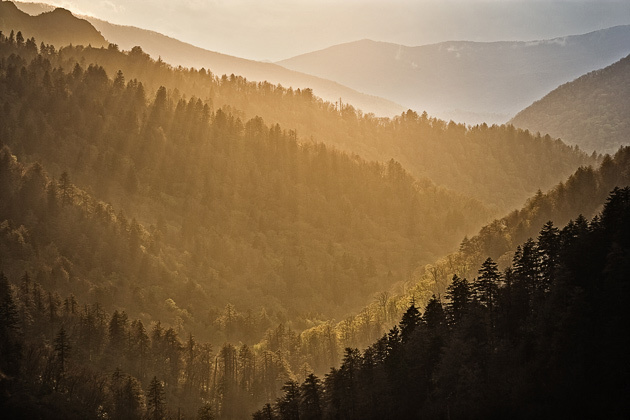 It’s a perfect spot to photograph a Smoky Mountains sunset, especially during the summer months when the sun is perfectly positioned to shine down the valley. This is a wonderful location for a Miles Away experience. Most folks zoom in, take a quick photo, and zoom off. It can get crowded here around sunset. But if you arrive early, or especially if a summer storm is clearing out in the late afternoon, you can watch the light change in subtle and beautiful ways. For example, the “spiritual light” reaching between the trees in the picture above only lasted for 30 seconds or so! It’s a good place to relax with a picnic and just watch and be there. The photo below shows the scene on a misty morning. The photograph above hangs in my gallery and is called Spiritual Light. 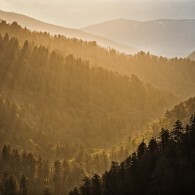 Please stop in for a visit to see the complete display of Smoky Mountains photography at the William Britten Gallery in Gatlinburg. 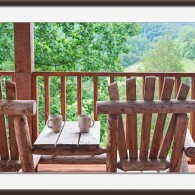 A classic Smoky Mountains morning. The signature blue haze, the tops of the ridges warming with orange as the sun approaches the horizon. How many of the receding ridges can you count? Twelve or thirteen at least. Dawn comes very slowly here. You can leave Gatlinburg in the dark and drive the 15 miles or so to the overlook. Bring along a thermos of coffee and park your car right in front of this view. First there’s a glow in the sky, then the ridges start to get detail. Soon the morning mist and the purples and oranges define the layers of the mountains. Wow! 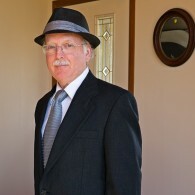 Click on the photo above to see a larger version. 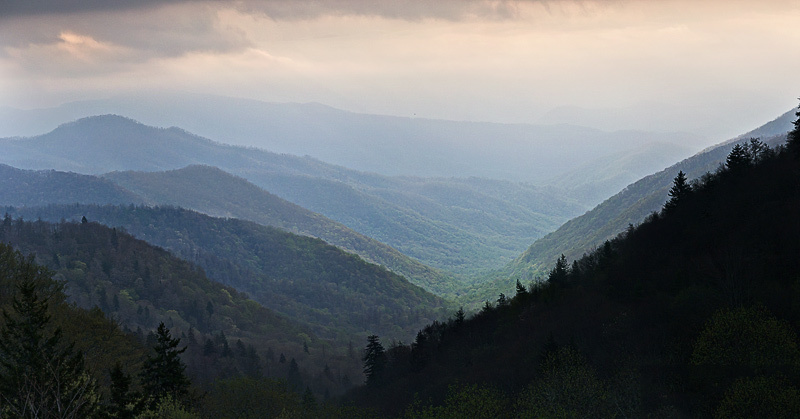 This photo was taken from the Oconaluftee Overlook, just past Newfound Gap in the Smokies. We’re looking east into North Carolina. This is an especially fine spot for early morning photography … one of the most accessible in the Smoky Mountains for a photograph like this. And this is only half of the total view! The other side of the panorama can be seen in one of my featured photos, Listening to Silence. 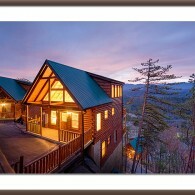 I’d love to show you the entire display of photographs at the William Britten Gallery in Gatlinburg. Please stop in if you can during your next visit to the Smokies. Miles Away on Monday: Last of the Snow? The Smoky Mountains are starting to look Spring-like on this last day of February, and our heavy winter snows may be over for the season. I really enjoyed them … the big Christmas Eve storm that gave us a White Christmas for the first time since we have lived in Gatlinburg. Then some more good storms in January. Scenes like the one pictured above might be memories until next year. But that’s alright with me … bring on the wildflowers! 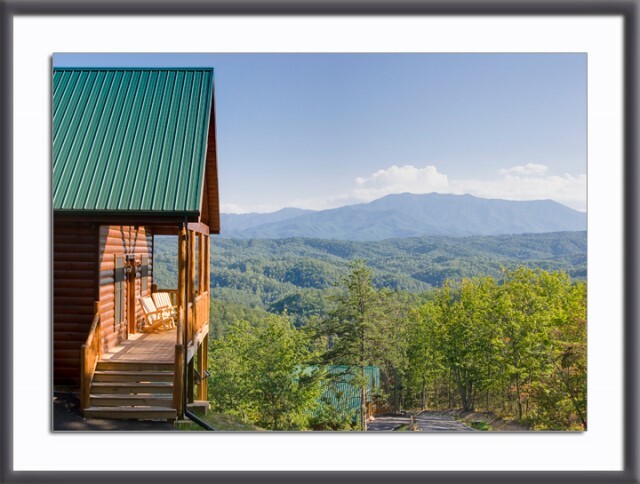 As always, the full line of Smoky Mountains Photographs is on display at the William Britten Gallery in Morning Mist Village on Glades Rd in Gatlinburg. 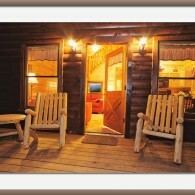 Hope you can stop by during your trip to the Smokies.